Custom Curves lingerie boutique specializes in bra fitting with an extended range of bra sizes- beyond what is available in mass market stores- enabling us to properly fit a wider range of sizes. The brands and styles carried are carefully selected for optimal fit and to suit a variety of needs. We are proud to stock and offer fittings in steel-boned corsets (waist sizes 20"-44"). Supportive bras do not have to be boring. Fashion conscious and forward-thinking, we aim to provide stylish, modern and practical options in order to make lingerie shopping fun! We strive to price our products affordably with the belief that a well-fitting bra should not be an unattainable 'luxury' item. 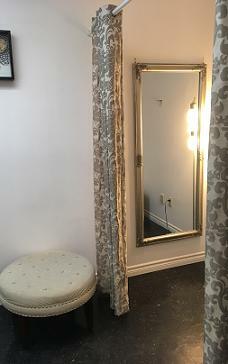 Fittings are complimentary, walk-ins are welcome. We fit all bodies and genders- bra fit education is for everyone! When you shop with us, your purchases and fit notes can be recorded on your customer profile to make future visits effortless. Appointments outside of store hours are available. (902) 405-5078 or use the online form. 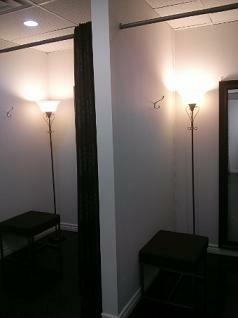 The fitting rooms at Custom Curves. Hand wash bras and hang to dry. Items in unused condition with tags intact may be returned or exchanged within 14 days of purchase. Bras that have been worn, damaged or altered may not be returned or exchanged. Underwear, shapewear and sale items are final sale. � Cutopia 2012. All rights reserved. Site design by eraserheader.